It’s that time of year again! 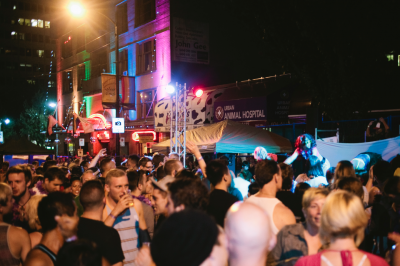 The Vancouver Pride Society is taking over Davie Street for the annual Davie Street Block Party presented by Barefoot Wines, Friday August 1 from 4pm to 12am. For 2014, Vancouver Pride will have two community blocks centred around Bute Plaza with our all-ages stage and dance floor at the rainbow crosswalks, along with a variety of local artisans and carnival games hosted by LGBTQ community groups from around Vancouver. ASL interpreters will be available in the community blocks. As well, come visit our main stage in the 19+ zone between Burrard and Thurlow. Tickets are $10 for the 19+ zone and available at Little Sisters (1238 Davie Street), Top Drawers (850 Davie Street) and online via EventBrite!